Also included: A giant robot, the best Rocket/Groot of the day, and lots of Doctors. And of course you, because home was right here all along. Day three of Comic-Con came and went with a bang. Starting with what is going down in history as the worst and most hellish Hall H line in history, and ending with the city of San Diego's Gaslamp District became nigh unwalkable thanks to the army of exhausted conventioneers partying for the last time before heading home today, it was a blast, even if, you know, that Hall H line was positively awful. 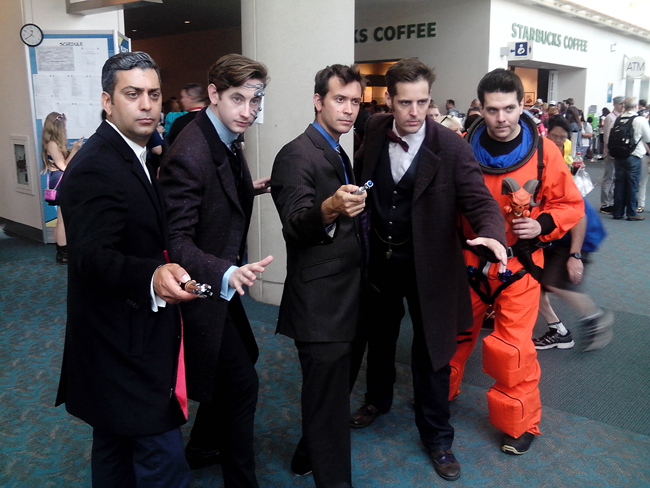 As befits the busiest day of the convention, cosplayers were out in full force. So much so that we have too many images for just one gallery, when means you can expect to see all the photos in the coming days. We'll start, however, with 24 of the funniest or just plain coolest stuff we saw while walking around and feeling like we were going to pass out. Enjoy. First up, I'm beginning to suspect that Doctor Who? cosplay is really just an excuse for guys to pull out their best dressy clothing and wear it to a convention.